Despite such strong support, however, the non-binding vote was unlikely to lead to formal independence, even as it escalated long-running tensions with Baghdad. Iraq and its neighbors, along with virtually the entire international community, oppose any redrawing of the map. The election commission did not release turnout figures for the disputed territories, which could serve as an indicator of how many people in those areas prefer Kurdish rule. Hendrin Mohammed, the election commission chief, told The Associated Press those numbers would be released by local authorities. He did not elaborate. Iraq's Shiite Arab-dominated parliament called on al-Abadi to deploy troops in the disputed territories, including the oil-rich city of Kirkuk, but al-Abadi said Wednesday he didn't want a "fight between the Iraqi citizens." Al-Abadi ordered the Kurdish region to hand over control of its airports to federal authorities by Friday, threatening a total flight ban if they refused. Iraq's Transport Ministry ordered international airlines to halt service to Irbil, the Kurdish regional capital, and Sulaimaniyah, its second city, beginning Friday evening. Most regional airlines said they would comply. Lebanon's flagship carrier, Middle East Airlines, EgyptAir and Jordan's national airline, Royal Jordanian, announced they would comply with the international flight ban to the Kurdish region, cancelling all flights after Friday. Low-cost airline FlyDubai said its flights to Irbil would be halted beginning Saturday. Turkey also warned its citizens that flight service to the Kurdish region would be halted, saying in a statement posted on the Turkish Consulate's website in Irbil that flights by Turkish Airlines, AtlasGlobal and Pegasus "won't be possible" after Friday evening. It added that authorities were working to increase flights until then. The transport minister for Iraq's Kurdish region said the region's international airports had not violated any laws that would warrant their closure. Mawlood Bawa Murad told reporters his ministry was ready to negotiate with Baghdad "if they want to implement the law and show that Iraq has one air space." He added that the flight ban would affect, "one way or another, the military aviation that operates from Irbil international airport," which is used for the campaign against the Islamic State group. However, the order from Baghdad stated that humanitarian, diplomatic and military flights would not be affected. 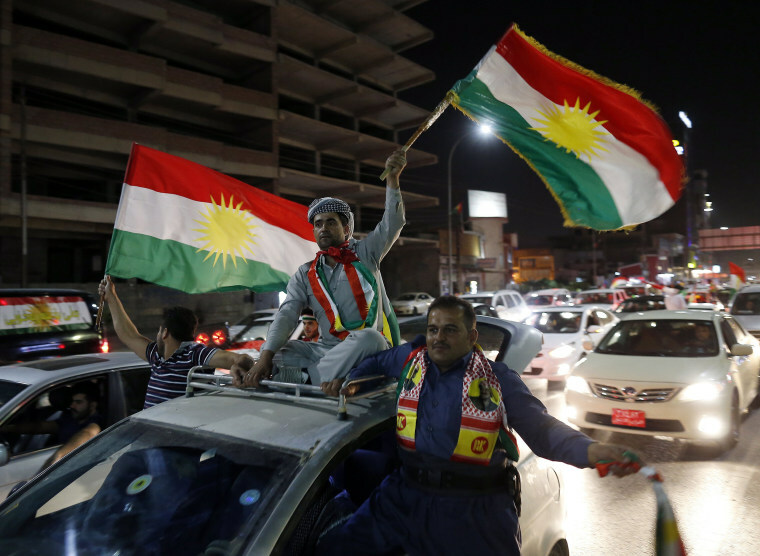 Mohammed, the head of the Kurdish region's election commission, shrugged off the ban, telling AP "we love our country, so if we don't fly, we are very happy here." The Kurdish referendum has the potential to weaken al-Abadi politically ahead of provincial elections planned for early next year. Former Prime Minister Nuri al-Maliki, who remains al-Abadi's toughest political opponent and is widely believed to be seeking a return to power, condemned the referendum as a "declaration of war." Hard-line elements of al-Abadi's government, including the largely Iranian-backed Shiite fighters known as the Popular Mobilization Forces, also called for a tough response and the use of force following the Kurdish vote. "We will not allow the division of Iraq," said Ahmed al-Asadi, the spokesmen for the Shiite forces, stressing that his forces would not target the Kurdish people as a whole. "Those who held the referendum and divided Iraq, those are our targets," he said. The Popular Mobilization forces have units near Kirkuk who are awaiting orders "to go to any city or disputed area to impose (central) government control according to the constitution," al-Asadi added. Iranian media, meanwhile, said Iraqi Army Chief of Staff Gen. Othman al-Ghanemi had arrived in Iran for talks on military cooperation and coordination. Al-Ghanemi met the Iranian armed forces' chief of staff, Gen. Mohammad Hossein Bagheri, and was scheduled to visit the two countries' joint border, the Mizanonline news website said.